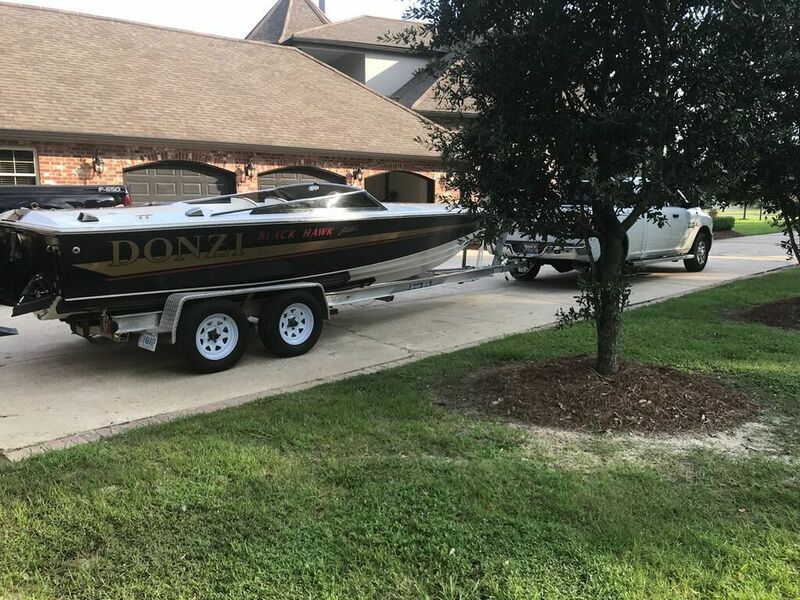 Blog about Boats Cars and what ever else grabs my attention. Sometimes you just find a boat and you have to look into it more. I happened to be looking thru motor yacht listings one day and came across a Carver 325. The reason it to me was the swim platform arrangement. Instead of a near vertical transom there was a series of steps in the platform allowing a non climb transition to the area above the aft cabin. Other then that change and some tweaks to the bridge this is the same basic 32' motor yacht Carver offered for a couple decades. But I like it might be my favorite small motor yacht. 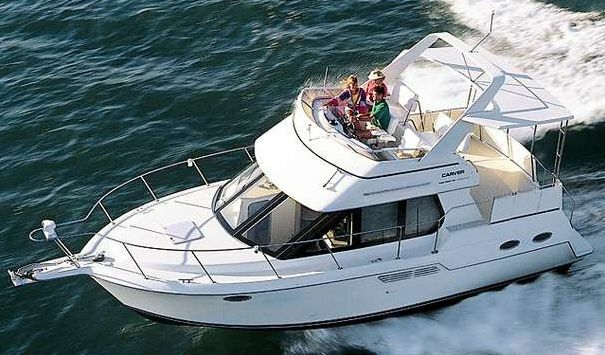 The arrangement below with a enormous v shaped dinette really makes it feel like a bigger boat and the berth arrangement in the back while a bit odd is versatile. Almost all of these are gas powered but diesel was an option. Interesting E-bay find. Donzi only made 40 of these back in the day. In collaboration with Mercruiser they had a twin prop surface piercing outdrive quite the toy. Unfortunately they became tough to fix later and many ended like this with a regular Bravo. These were around $55,000 new if I recall so trading around 12k seems a deal before the 2008 collapse I remember seeing them stil getting in the mid to high 20's. If you go walking thru a boat show today you will see a number of new boats with outboards hidden behind covers. The Searay 370 is one of the best known example of this. With Twin Mercury outboards hidden under fiberglass cowlings forward of the transom, it looks like a sleek express cruiser with a secret. Of course this idea isn’t new. 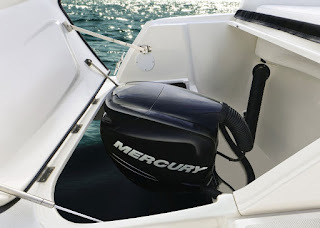 People have been trying to hide outboards basically since outboards were invented. You will notice a small addition to the Mercury in the Searay above, a fresh air vent to keep the engine well fed with clean air. I have seen this in a few homemade wooden boats and a handful of modified sailboats thou of course without the nicely molded OEM cowl. Why you might ask do people want to hide their shiny expensive outboard. Well for one lots of people don’t like the look of them hanging off the rear of the boat. They also tend to handle differently then inboard boats due to both their prop design and extreme aft placement. By moving them forward you can use them better for pivoting while docking etc. They also tend to quiet the outboard down. Why not just install a stern drive? Several reasons. One for most of the past few decades stern drives used automotive engine blocks as their bases. While this works well in certain marine applications it does not normally perform as well as an engine designed for the specific task (note we now are seeing new marine specific sterndrive engine blocks again). The design also requires some packaging tradeoffs such as the large amount of space forward of the transom and the fact that you have introduced complexity with two ninety degree drive shaft changes as well as a CV joint and transom sealing issues. On to the title. In 1991 OMC came up with the OMC quiet rider with 90hp, 115hp and 150 hp power heads. While at first the concept looks much like the conventional outboard slapped in a well, OMC actually seems to have spent quite bit of time and energy developing it. You can tell by the name quiet rider that the main idea was sound proofing. This was based on a 2 stroke V4 OMC (V6 for the 150) power head which, while a very rugged engine, are not the quietest power plants around. To hush things down a fiberglass enclosure was added over the engine but they also sealed the cowl much more tightly now that air was coming thru a ducted hose rather then inlets in the cowl. the result was greatly reduced noise level in the boat. Noise levels behind the boat were similar to the regular out board as the opening rear of the transom was maintained to keep the boat an outboard in the eyes of the USCG etc as well as allowing for exhaust to exit. The cowl was not only designed to fit better it also was more form fitting to allow for the smallest possible enclosure while still allowing for the motor to fully tilt. The designers also moved the pivot point of the out board lower then normal to accomplish the low cowl height. The motor now pivots on two brackets on either side of the transom notch rather then on the steering tube assembly which is bolted to the transom as with most outboards. These pivot brackets were bolted into stringers that were located on either side of the transom notch. On the other side of the pivot bracket were two aluminum tubes on which the actual outboard was hung. With the force now directed into the stringers the outboard had a much more secure mounting and the engineers could better isolate the NVH then they could on a boat with a standard transom. 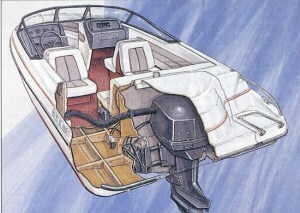 The Quiet rider was never sold to other boat companies outside of the OMC brands. In the early 90’s OMC owned several in house brands. The first brand to introduce the Quiet Rider was Sunbird on their Eurosport line. I believe only a 19′ (190) and later 21′ (210) models wre made. There was also a 19′ Chris craft version (another brand owned by OMC) but I have never seen one in person. I seem to remember seeing a version of a Sunbrid Neptune walk around with a Quiet Rider, but no information on this seems forth coming on the web. In the end the Quiet Rider was cancelled in 1995 due to slow sales and some issues with certain models stalling and running poorly thanks to exhaust build up in the transom notch. Some see this as an OMC deadly sin, I look at it more as a engineering company trying to solve a problem in a unique way. 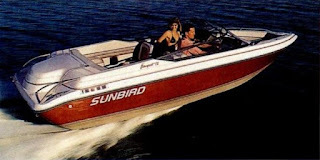 These boats are still around, in the past 3 years I have seen at least 3 Sunbirds with the Quiet rider system come up for sale here in Connecticut. Pricing is all over the map but must were advertised in the $2,500 range. Hopefully a few will survive as most parts are shared with other motors, but eventually there will be fewer and fewer as corrosion claims the custom aluminum bits that support the motor. Just another chapter in american boating history. Bahn camper works. Moving campers into modern construction. I have been interested in RV's for a long time. Over the years I have noticed they tend to built incredibly cheaply with a few notable exceptions (air streams, certain fiberglass campers, bus conversions). The most common build is basically stick built with sheathing hung on wood framing. you also then have some with aluminum framing. You have also had a number made with fiberglass, much like how a boat is constructed with a top and bottom section molded and then bolted/sealed together. One of my personal favorite types of RV is the truck camper. Having a removable living section and a truck to tow some other toy like a boat or ATV seems ideal. One issue these campers have is that weight is a major issue. 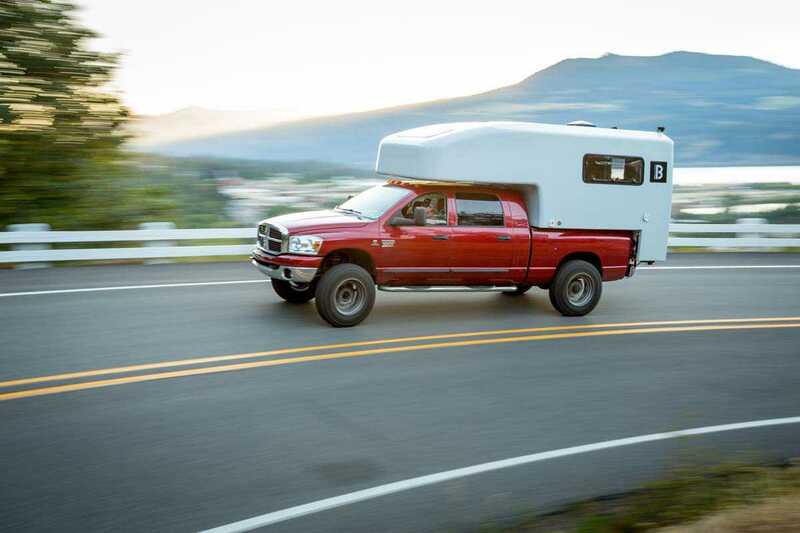 Pickups have limited payload and truck campers often push the limits of these payloads. These would make them ideal candidates for lightweight composite construction with cored composites. While there are fiberglass camper builders out there making outstanding products they seem to stop short of using the most up to date weight reductions methods available. Enter Bahn camper works. They are using cored composite panels bonded into a single structure. Which makes for an excellent light weight and long lasting construction. 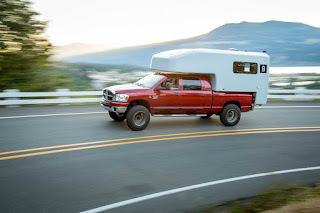 While I don't completely love their layouts and designs it's nice to see some real innovation on the weight and construction of truck campers. Looking forward to see how they move forward. Also to see some more custom designs as they offer bare shells for either custom or DIY builds. For more information see Bahn Camper works. If your into cars (well trucks I guess) you likely know that GM offered 2500 versions of the Suburban and Yukon XL. Most of these heavy duty people haulers were bought by government fleets for everything from security to Fire and Police command cars. Whats a little less known is that the open backed Suburban better known as the Avalanche also had a 3/4 ton 2500 version during it’s first generation. Oddly, enough the first (and possibly only) one of these I have seen in person was actually the first Chevy Avalanche I ever saw in person. Back at the time of its release I was working at a marina, and we were having some grounds work done and the owner of the landscaping company showed up in a brand new Avalanche 2500, towing a Bobcat skid steer of all things. I remember walking up to it thinking that’s an odd load for a new fangled truckUV to be towing. Then I saw the 8 lug wheels and made a mental note to crack open AOL and look it up at home that night. Even thou it’s often ridiculous that mass market auto makers go down a rabbit hole trying to find buyers for niche products they would have been more profitable without, as a car guy I love the wake of oddities it leaves behind. So what did ordering a 2500 get you over a 1500 Avalanche? Well mostly it got you an open bed Suburban 2500. GM was nice enough to give you a Big-block V8 the vortec 8100 (8.1 liter displacement) standard on the 2500 where as it was an option on the Suburban (the 6.0 was standard). It also gave you a slightly less cushy ride with leaf sprigs swapped in for the standard coils. You also got a full floating rear axle and of course those cool 8 lug wheels. The frames were also different the 2500 closer to the pickups then the normal Suburban/Avalanche setup. Now why would you order this? My guess is Chevy was targeting the RV and big boat crowd with this one. Unlike the 2500 suburban with it’s somewhat automatic government orders the avalanche had little use in fleets (thou I have seen a few in fire dept livery). It could however tow 12,000 pounds with the optional 4.10 gear-set and 10,000 with the 3.70 gear-set. Making it the perfect truck for towing your fountain executioner or that tag along toy hauler to the desert. It was also likely one of the last big block sedans you will ever see. Came across this little guy in Marblehead MA last year. 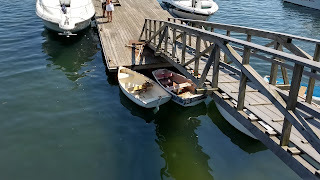 Looks like a conventional little fiberglass dinghy. 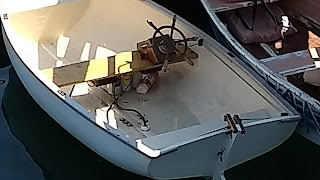 A simple rope and pulley arrangement controls the rudder to a little wheel. The neat part is there appears to be a Optima AGM battery ahead of the thwart and cabling leading down to what I guess would be a trolling motor or similar electric pod drive. Would love to be able to find out more about it. Lets try a new feature for today. 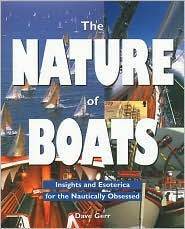 Book review of Dave Gerr’s book, Nature of Boats. The book covers topics such as boat construction, design , stability and performance. It also features a number of drawings from Gerr’s own designs. The book’s short articles allow for easy reading while providing a wealth of information, This helps avoid the book feeling over technical (boring) that some of the other books touching on basics of boat design can be. I personally love to read Gerr’s view of performance power and sail craft as well as his well though out alternatives, Like Needle a lovely high speed power boat that relies on hull shape and waterline length to achieve economical high speeds. There is also parts that come off as more off a how – to book, such as the chapters on Nestor the nesting dinghy. Overall if you have a deep seeded interest in boats I recommend you pick up a copy and take a look. Upcoming Events of Interest in New England.